Every business has a duty of care when it comes to the environment. That’s why we’ve been working behind the scenes for years to develop products that are sustainable and help our clients meet strict green targets and policies. Here, we take a look at products that have been designed with environmentally friendly print in mind and explain how buyers and decision makers can minimise their impact. As more companies look to reduce their usage of harmful resources and strengthen their eco credentials, they’re turning to environmentally friendly choices in print finishing. Possibilities are vast in terms of eco-friendly lamination. Waste paper recycling usually involves mixing used paper with water and chemicals before being broken down into strands of cellulose, which is a type of organic plant material. This pulp, as it’s known, is strained through screens to remove any remaining laminate or adhesive in the mixture. It’s then cleaned, de-inked, bleached and mixed with water and can be made into new recycled paper. Cellogreen is our star eco-print laminate. It’s made predominantly from cellulose and as well as being fully recyclable, it’s also biodegradable and compostable. It provides the same aesthetic as OPP lamination but can be recycled in a normal re-pulping system. Meanwhile, Mirri AG is a fully recyclable alternative to oil-based products and ideal luxury packaging. We also work with bio-based films, which are made from renewable sources like corn starch or sugar cane, and oxo-biodegradable lamination films, a polypropylene-based plastic made with a salt additive. After around two years, the salt starts the process of oxidation and eventually biodegradation. Eco print solutions don’t stop at lamination, though. UV varnishes can be extremely environmentally friendly. When cured, UV inks don’t contain any solvents, oils or hazardous compounds. Plus, they can be easily recycled and they’re biodegradable so they make for a high-quality sustainable solution. Water-based coatings are an eco-friendly go to (as opposed to oil-based). They reduce atmospheric pollution thanks to minimal VOCs and they’re recycled in the same way as uncoated products. As the industry continues its drive to reduce and minimise environmental impact, there’s a misconception that to be sustainable is to be less visually appealing or that it requires compromise on quality. We’re huge advocates of the quest for greener print and our finishes are designed to demonstrate that print can tick each and every box. 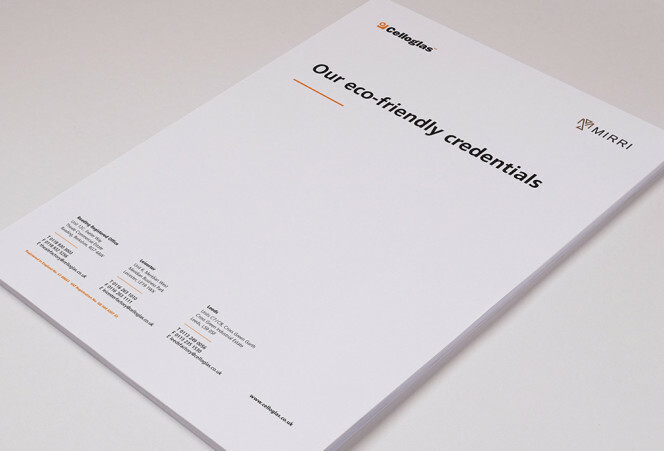 To find out more about how you can minimise your environmental footprint, download Celloglas’ eco credentials.